ASUSTOR integrates four USB DAC devices from ASUS including the Xonar Essence III, Xonar Essence One, Xonar Essence STU and Xonar U3, providing users with a rich and full hi-fi listening experience. 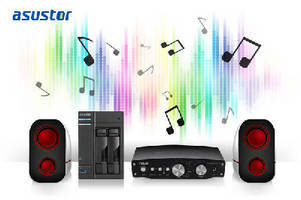 Taipei, Taiwan, – ASUSTOR Inc., a leading innovator and provider of network storage solutions, announced today that it has added support for USB digital-to-analog audio converters (DAC) giving ASUSTOR users the ability to use a USB DAC to increase the quality of audio output from their NAS devices. A USB DAC can be conveniently used in concert with ASUSTOR’s SoundsGood music player App to provide users with a heightened listening experience featuring fuller and deeper sound. Featured in this integration of USB DAC devices are four models from ASUS. These models include the Xonar Essence III, Xonar Essence One, Xonar Essence STU and Xonar U3. The exclusive SoundsGood Web music player App was developed in-house by ASUSTOR and is available for all ASUSTOR NAS devices. Users can download and install SoundsGood free of charge from App Central. SoundsGood allows users to directly stream and play music from within ADM and allows users to create and edit playlists. Additionally, SoundsGood contains a built-in ID3 tag editor and also supports the showing of album cover artwork, giving users added convenience when searching, managing and editing their music content. Furthermore, SoundsGood features multiple options for audio output from the NAS* including connecting to an amplifier via HDMI, USB DAC output, output via Bluetooth speakers or output from speakers connected to the NAS’s audio-jack. This provides a great deal of deployment flexibility to users, allowing them to select the output method most suitable to their needs. SoundsGood can also be used with the AiMusic mobile app which allows users to remotely stream music from their NAS while on the go. AiMusic supports both online and offline music playback and allows users to change tracks by shaking their device. AiMusic is currently available for both iOS and Android devices. *HDMI output is available on: AS-6, AS-3 and AS-2TE series devices. © 2013 ASUSTOR Inc. ASUSTOR and all other ASUSTOR product names are trademarks or registered trademarks of ASUSTOR Inc. All other product and company names mentioned herein are the trademarks of their respective owners.